No, not Bali or Barbados - this marvellous scene greets visitors to the tenth floor of Singapore Airport's newest addition, the magnificent lifestyle complex of Jewel Changi. Yesterday the world's favourite airport - Changi Airport Singapore - invited visitors inside of the much-anticipated Jewel Changi Airport extension for a sneak preview ahead of its grand opening on Wednesday, April 17. The airport also aims to attract domestic visitors and tourists to its shops, cinemas and food and beverage outlets. 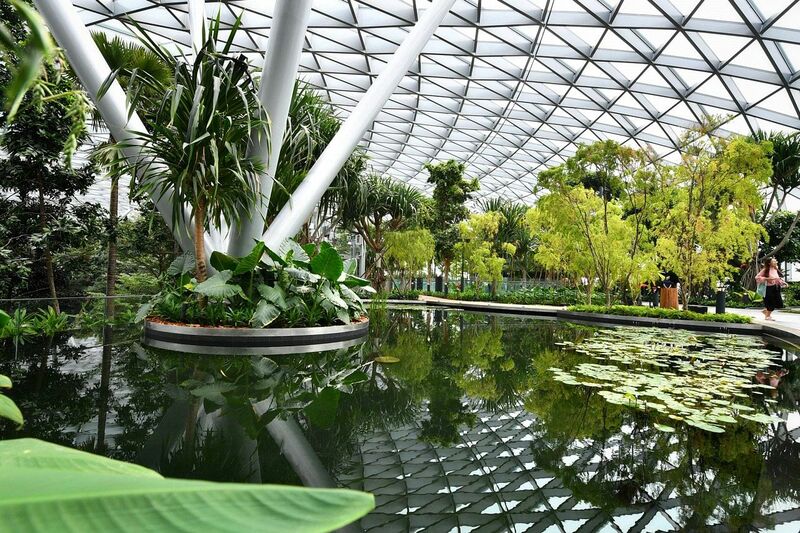 Hung Jean, chief executive officer, Jewel Changi Airport Devt said, "At Jewel, we want to delight our visitors with one-of-a-kind play attractions that complement the natural surroundings and myriad offerings within the complex". The 40-metre high Rain Vortex, which is the world's tallest indoor waterfall, is seen from inside Jewel Changi Airport. This brings the airport's total capacity to 85 million, ensuring that it remains well placed to support the growth of air travel in the region. Play attractions such as the Manulife Sky Nets, Hedge Maze, Mirror Maze and Discovery Slides were created to blend into the unique indoor garden environment and will open to the public in June this year. Jewel is now open to the pre-registered pubic starting from Thursday and will be officially opened on April 17.